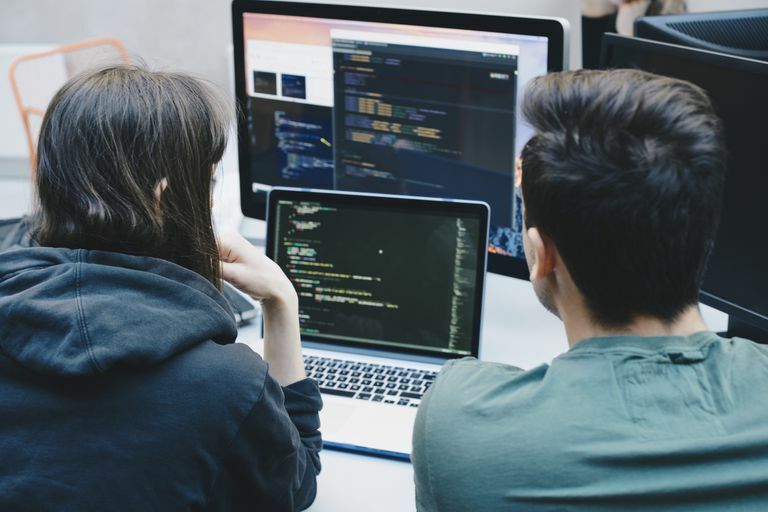 Knowing how to code can unearth a wealth of possibilities, ranging from promising employment opportunities to the ability to create your own applications. With so many programming languages out there, however, figuring out where to start can be a little intimidating. We've listed the best languages to start learning to code below, based on a number of factors including complexity level and overall demand. No programming language is easy to learn, but the degrees of difficulty can vary significantly from one to the other. Therefore, it's important not to dive into the deep end on your first attempt. With a relatively easy-to-use syntax that makes it a logical jumping-off point for new developers, Ruby offers a level of readability not found in most programming languages. In fact, it's widely referred to as the coding language that most closely resembles spoken languages like English in terms of its construction and sensible flow. Ruby is a dynamically typed language, meaning that variable types are checked at run-time as opposed to this validation taking place at compile-time. Since these types are not checked until code execution, it is a much more forgiving language for newbie programmers. Even though Ruby is ideal for beginners, it's not just a stepping stone and can be pretty powerful when used in conjunction with the Rails framework - a duo commonly referred to as Ruby on Rails, found often in database-driven web development including several well-known sites and services. There are downsides that accompany Ruby's flexibility and simplicity, however, one being its less-than-impressive performance and speed when compared to other popular languages. Scalability concerns are also expressed about this general-purpose language, although in some cases that may not be warranted. Perceived limitations aside, Ruby can serve as an excellent starter language which in turn can be quite useful once mastered. Another general-purpose language, Python is also recommended for beginners as you can often learn to script basic functionality on your first day when following a good tutorial. Not only is it helpful in understanding fundamental coding concepts, being well-versed in Python is an increasingly desired skill across multiple industries. Employed on the backend of some major services including Instagram and YouTube and also heavily utilized by data scientists in what has become a rapidly growing field, Python is even used to build video games in conjunction with the PyGame library. As with Ruby, you can assign a string to a variable that initially held an integer, and vice versa. It's important as you're learning that you use Python's flexible nature for good, however, and not to develop sloppy coding practices. Since there is typically less code and therefore less typing needed than in many other languages, it should be even easier for you to focus on proper structure and syntax as you move forward. Let's get this out of the way: These aren't programming languages as they are typically defined. That being said, they are approachable and pretty easy to learn. HTML and CSS are not the same language and are not interchangeable terms in any way. With that said, we've combined them here since many coders choose to learn CSS in parallel with learning HTML — the main reason being that they are both key to webpage (and other web-based outputs) design, display and even behavior. HTML is a markup language, and therefore utilizes tags to define all elements within what is essentially a document. This document, when properly constructed, can then be rendered in a web browser or other compatible display mechanism. CSS, meanwhile, dictates how these HTML elements are to be displayed by taking control over the page's layout. HTML5, in particular, has become increasingly popular for creating smartphone apps as well, dispelling the outdated notion that this combination is only useful when programming websites. It is not overwhelmingly difficult, and therefore serves as another ideal starter language for budding developers. Once you've got some programming experience under your belt, preferably with one or more of the languages discussed above, it's time to delve into something slightly more advanced. Also object-oriented, this general-purpose language is often the weapon of choice when coding applications to run across most popular platforms such as Linux, macOS and Windows. Java is also the main language of the Android operating system, therefore the most-used when creating apps for that OS. Its 'write once, run anywhere' slogan highlights this vast compatibility which, along with its powerful core and comprehensive Java Runtime Environment (JRE), makes Java an attractive choice for individual programmers and larger development shops alike. While certainly not as easy to learn as the languages we've covered up to this point, the web contains a treasure trove of materials and support forums that often feature step-by-step guidance from top-of-the-line developers. You're never alone when you get stuck on a Java problem, as your answer almost always lies somewhere among these seemingly limitless (and often free) resources. Just as Java is the preferred language for developing native Android apps, Swift was created by Apple for the sole purpose of programming macOS, iOS, watchOS and tvOS apps. This open source language is intended to be an improvement on Objective-C, making APIs simpler to read and maintain while automatically handling memory management. Swift's benchmarks on the Apple hardware it was designed specifically for tend to impress, with noticeably improved speed over non-native apps or those developed in a different language. Its basic syntax and libraries are structured in a way that simply make sense, purposely deviating from unnecessary confusion as much as technically possible in some areas. One of the other reasons we like Swift as an advanced language for newer programmers is the Swift Playgrounds app, which provides one of the most enjoyable learning experiences around when it comes to coding. Perhaps no technical field is growing faster than big data, with salaries for data scientists and other related positions climbing at a rapid rate. The most enticing aspect of this field, aside from the money, is that it spans several popular industries on an ever-growing list. Whether you're looking to work in finance, sports, the medical field or somewhere else altogether, understanding data exploration and development might be your ticket. A free open source language and environment focused on statistical computing and its corresponding graphics, R is a favorite for analyzing and manipulating large data sets. While not as established as some of the other languages in this article, there are some very helpful manuals available from the R development core team as well as a number of other worthwhile resources throughout the web. The learning curve may be a bit steeper if you're not mathematically inclined by nature, but pushing through those tough moments can be very rewarding in the long-term. This should not be considered an all-inclusive list, as your particular situation may dictate learning another language altogether such as C++ or PHP. What Are the Advantages of the Programming Language Scala?